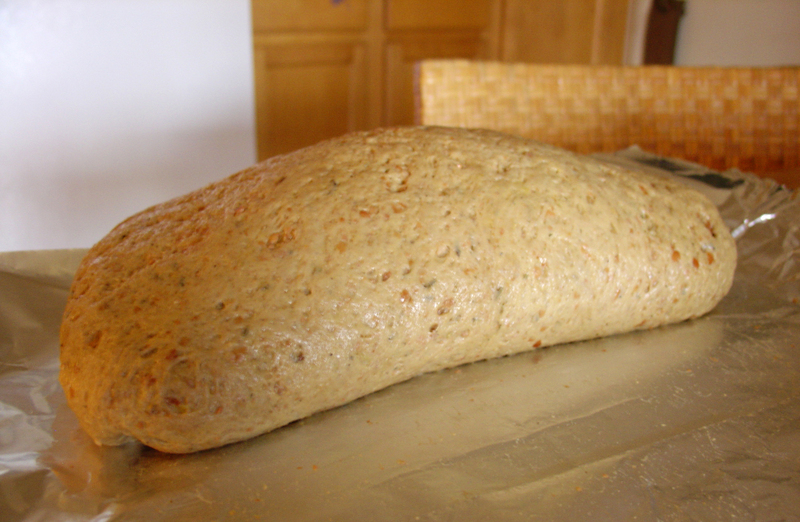 I had been wandering around the Internet, looking for a good loaf-like thing to make for Thanksgiving. I hadn’t found anything that looked good, and decided to just make tamales, instead. Then, on Wednesday morning I woke up to find that Isa of The Post Punk Kitchen had cracked the magical code she’d been working on, apparently for 20 years, and had come up with a perfect seitan loaf to be filled with mushroom stuffing and baked in tinfoil. Seitan roast stuffed with shiitakes and leeks. 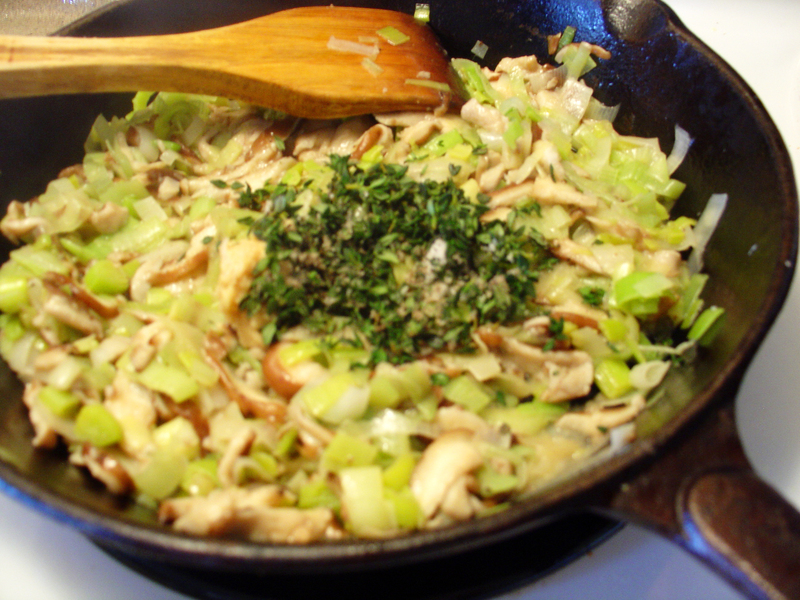 I had never used shiitake mushrooms or leeks before, so both of those were chopping adventures for me. I have to admit that mushrooms creep me out a bit. They’re just…weird looking. And a little dirty, maybe? I don’t know. Regardless, I rinsed the mushroom, removed the stems, and sliced them. 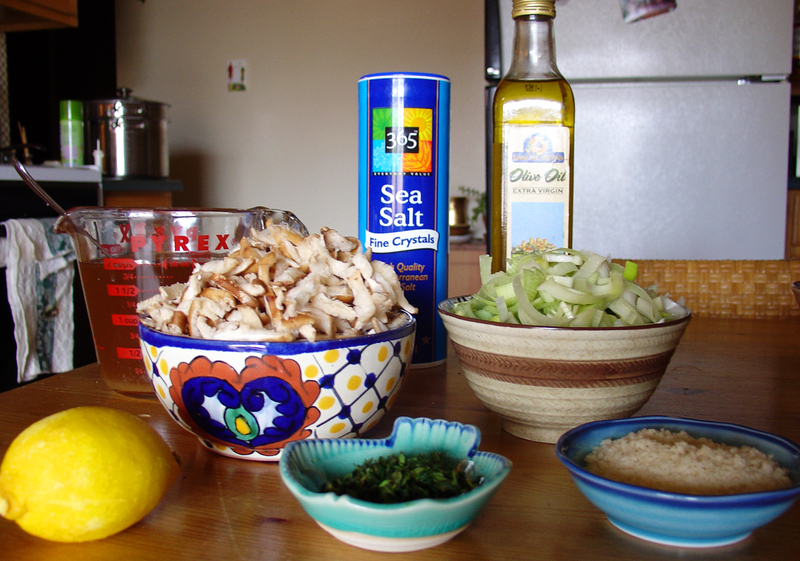 Then, I sliced the shallots into half-moons as the recipe said to. (I think I did, at least.) The poor lemon had suffered through a fairly unsuccessful zesting earlier in the day, so it was starting to look a little pathetic by this time. But, it was still up for a juicing for the stuffing. I also struggled a bit with the thyme. I don’t know if there’s a better way to remove the leaves from the stems than the one I used, but the leaves just kept sticking to my hands and fingers and it was driving me nuts. Eventually, I got the required amount of thyme off the stems. For the bread crumbs, I used panko, because that’s what I had. So, I started by making the stuffing. Seitan loaf stuffing; mushrooms, leeks, and thyme. Every time I sauté vegetables, I’m surprised by how much they reduce. Every. Single. Time. I finished the stuffing and was pretty satisfied. 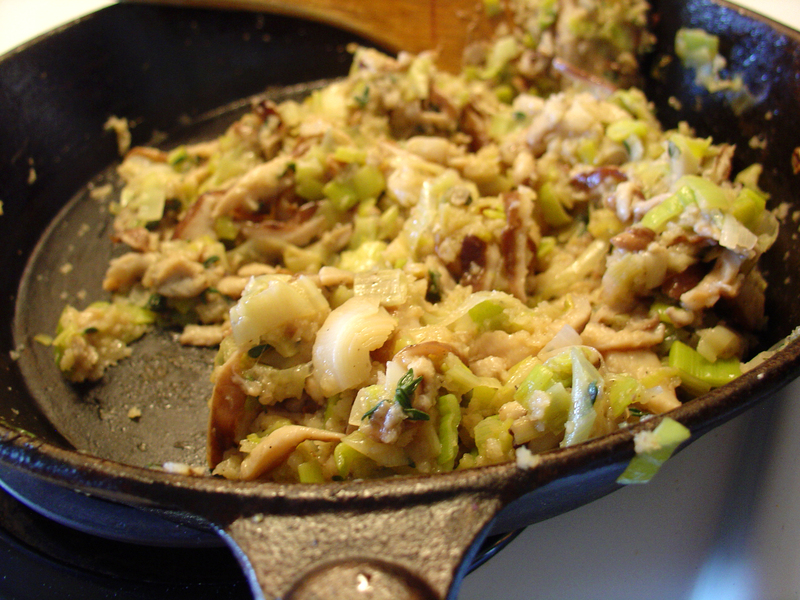 It smelled good, and I’d successfully cooked shiitakes and leeks for the first time. I set the stuffing aside, and started with the seitan loaf. First I put the beans and broth (and assorted other ingredients) into the food processor. 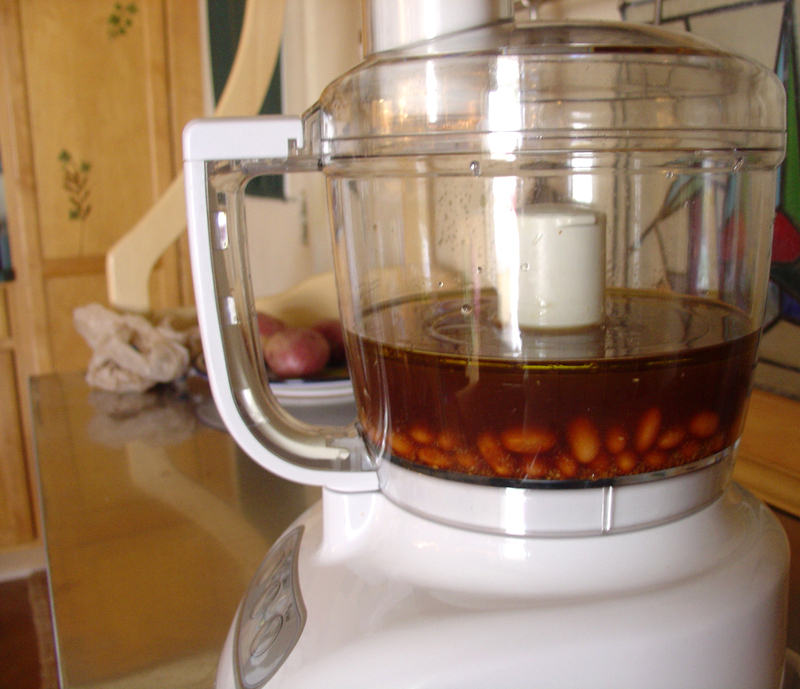 Beans and broth in the food processor. This is only exciting because I just bought this food processor. 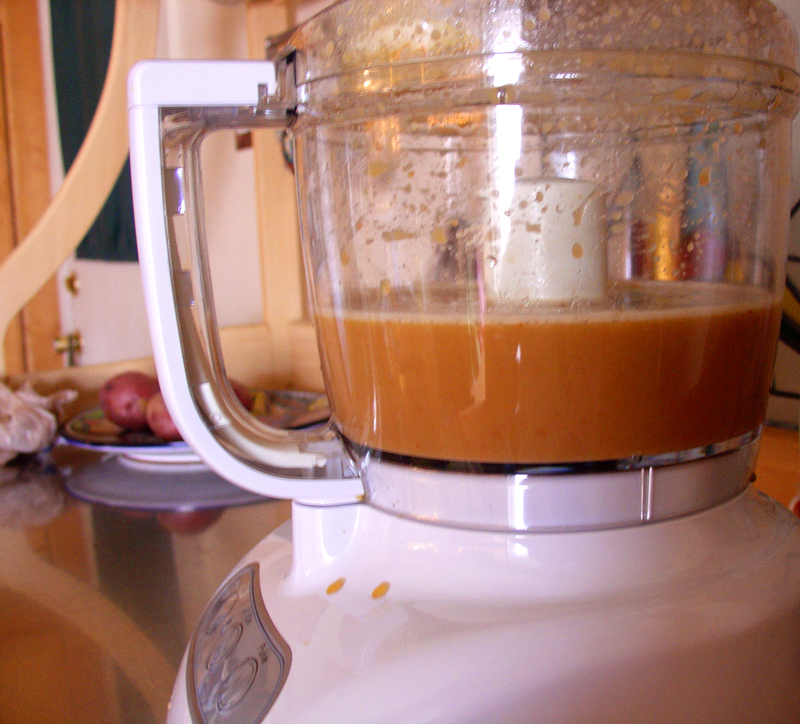 Previously, I did all my blending and processing in the Magic Bullet, which, while magic in many ways, is quite small. Unfortunately, even though I followed the “don’t fill with liquid above this line” rule, the food processor still leaked liquid. Slightly leaky, but the job got done. Even with the leakiness, it was probably less messy than having to do this blending in two or three Magic Bullet cups. 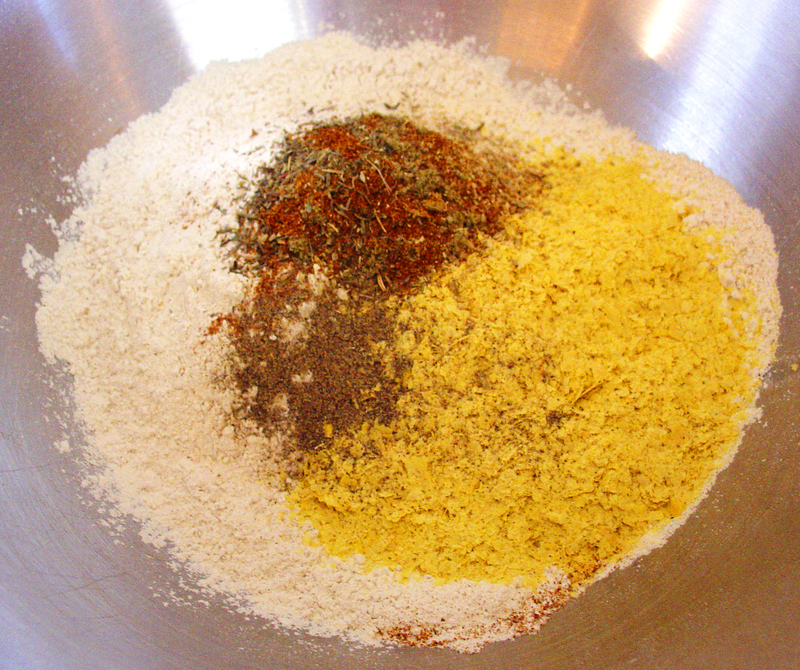 Next, I mixed the dry ingredients for the seitan. 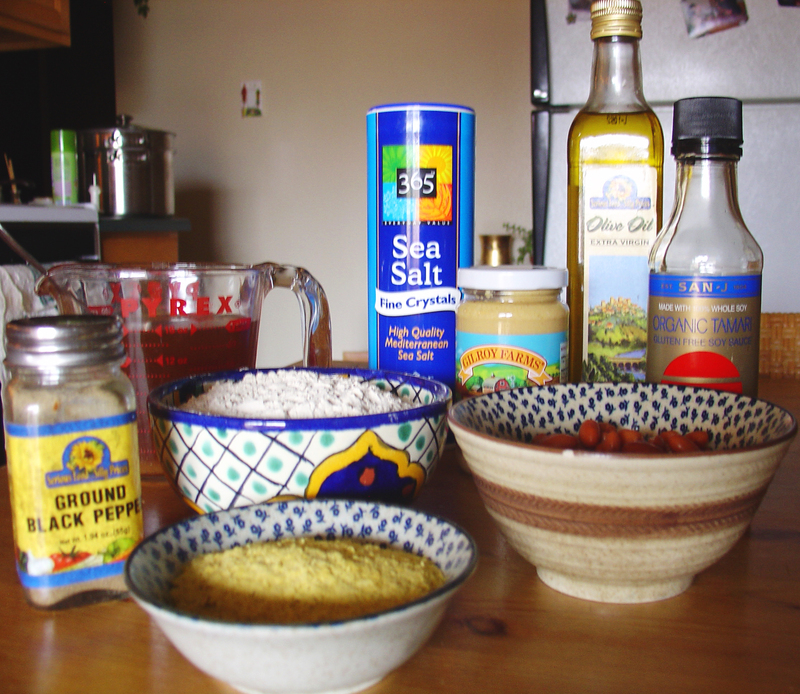 Then I slowly poured the wet ingredients into the dry ingredients. 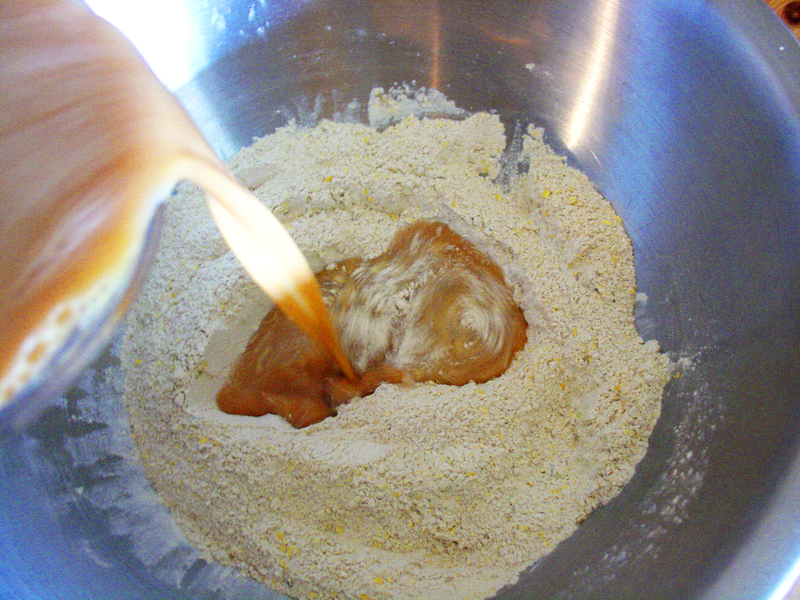 Pouring wet ingredients into dry ingredients (action shot one). 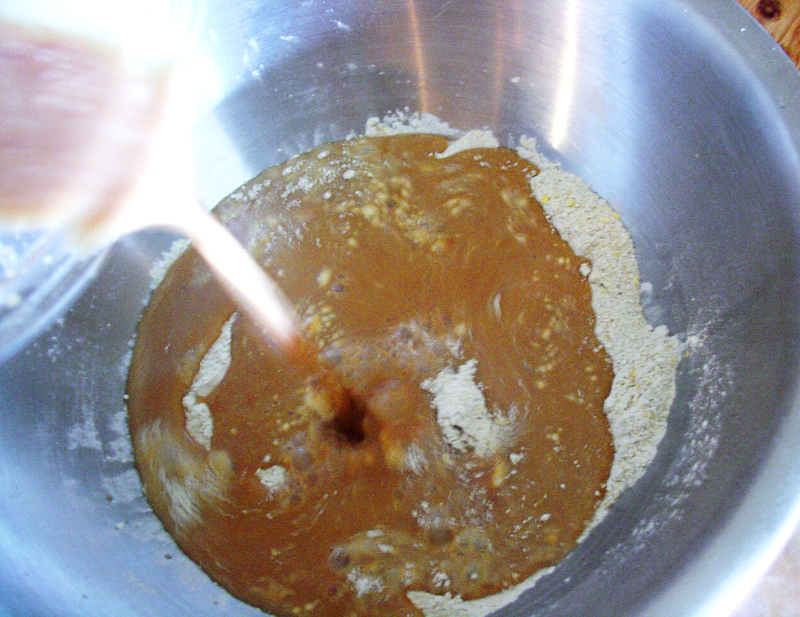 Pouring wet ingredients into dry ingredients (action shot two). And I poured some more. 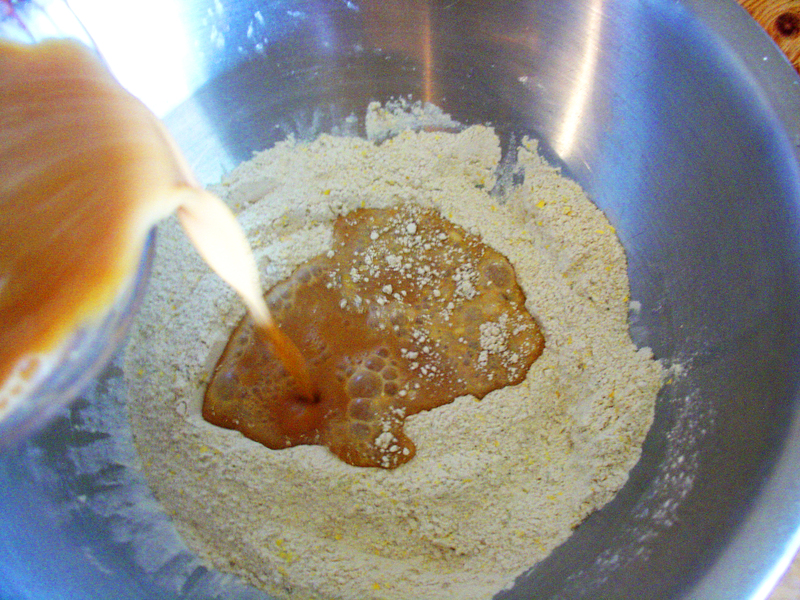 Pouring wet ingredients into dry ingredients (action shot three). I kneaded the dough and stretched it out onto some tinfoil. 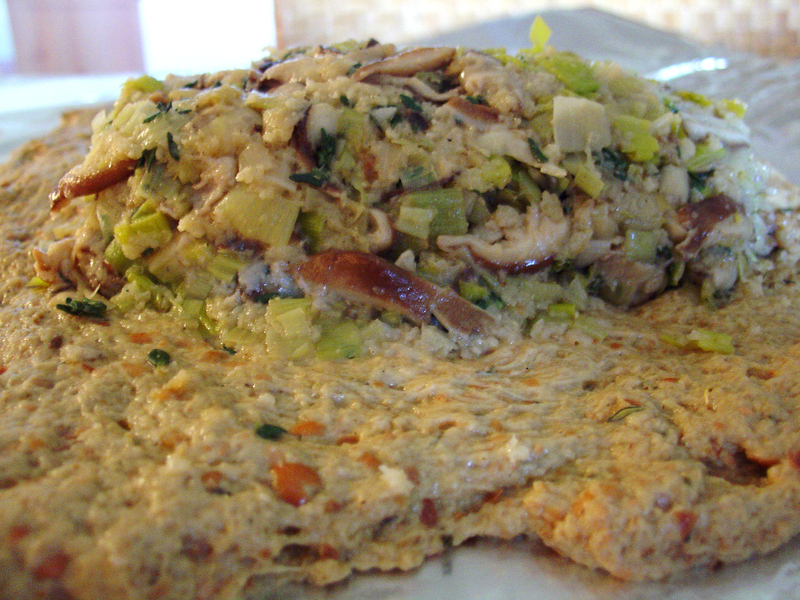 Then, I scooped the stuffing out of its pan and dropped it onto the seitan loaf dough. I wasn't expecting the stuffing to be as moldable as it was. I rolled it all up. This process was surprisingly easy! I thought it would be messy and/or difficult, but I rolled it up without any problems. 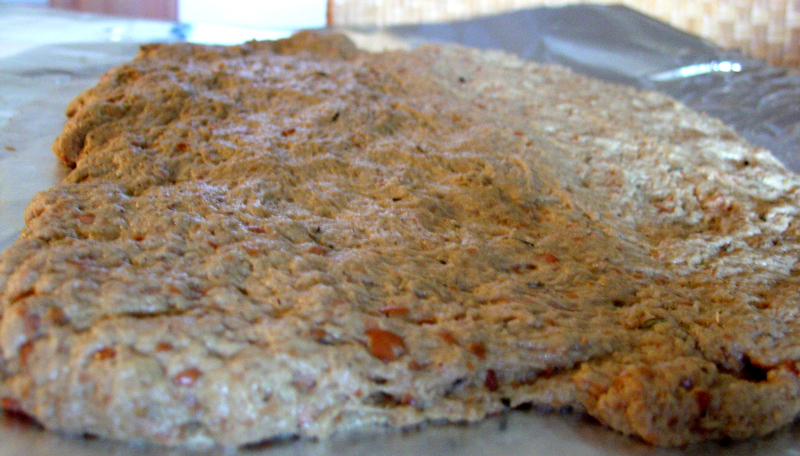 Seitan loaf, rolled and ready to bake. I baked it for 50 minutes like the recipe said, but when I peeked at it, it didn’t seem done yet, so I baked it for five more minutes. I took it out of the oven again, let it cool for a while, and looked again. It looked like the edges were starting to brown a bit like Isa’s pictures showed, but the middle still seemed pretty raw. So, I put it in for about ten more minutes. By this time, I think it was more done. But, I’m not entirely sure. Regardless, when I reheat the leftovers, I will be reheating it in the oven, so it will get a few more minutes of baking time then. After making this (and the various other things I made that day), I was too tired to make any gravy. 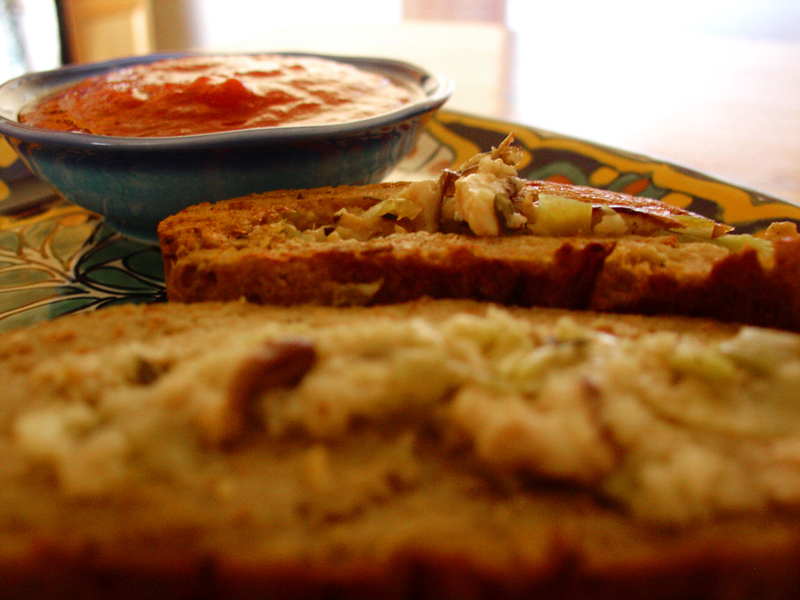 But, I did eat the loaf together with an applesauce based fruity thing that I made. The sweet fruit sauce made a good accompaniment to the seitan loaf. 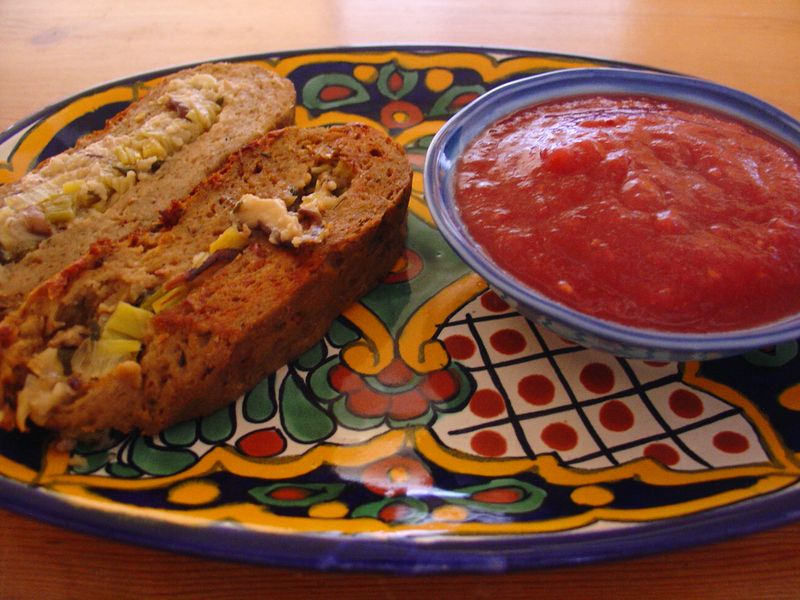 Seitan loaf slices with mixed-fruit sauce. I was really happy with how this turned out, and will definitely make it again for big food-centered events that require loaf-shaped food.